The state of North Carolina requires all vessels to have one Type I, II, III, or V PFD of a suitable size for each person aboard and each skier being towed. In addition, all vessels 16 feet or longer must have a readily accessible Type IV U.S. Coast Guard Approved PFD. Required PFDs must be US Coast Guard-approved and readily accessible. North Carolina law requires the owner and/or operator of a vessel is responsible to carry, store, maintain, and use the safety equipment required by the federal safety equipment requirements adopted by the U.S. Coast Guard. All boaters or passengers under the age of 13 on the deck or cockpit must be wearing a PFD while the vessel is underway. It is illegal for the boat operator to operate a vessel or be towed by a device (water-ski, tube, wakeboard, etc. ), while intoxicated or under the influence of drugs. In North Carolina, no person shall operate any motorized vessel, surfboard while under the influence of any impairing substance. They shall also not operate any motorized vessel after consuming alcohol sufficient to cause a blood alcohol concentration of 0.08% or greater. 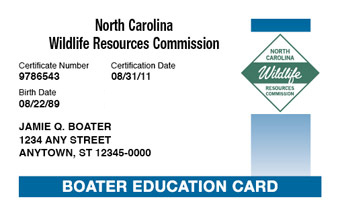 The North Carolina Wildlife Resources Commission (NCWRC) is legally responsible for vessel registration in North Carolina. All motorized vessels used on public waters including personal watercraft. All sailboats used on public waters longer than 14 feet at the load waterline. Vessels properly registered in another state, using North Carolina waters for more than 90 consecutive days. It must be signed and carried onboard when operating the vessel. 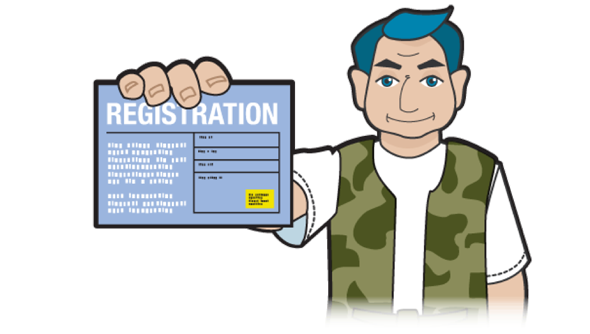 Boat owners can choose to register their vessels (certificate of number) for either one or three years. The NCWRC must be notified within 15 days if the boater changes residences. If a boater looses or destroys the certificate of number or decals, an application for a duplicate must be submitted along with the processing fee. For example: NC-1234-BX or NC 1234 BX. This is a federal and state requirement. Lack of the correct documentation can result in delays and fines. Make sure all boats are properly marked and documented. It's important to keep your papers with the boat – be particularly aware when transferring ownership of your vessel. See the following chart for a list of registration fees. Non-native aquatic species, plants, fish and animals are invading North Carolina's waters. These pests can increase dramatically under the right conditions, displacing native species, clogging waterways, and impacting navigation and recreation. Once introduced, they are nearly impossible to eliminate. Zebra Mussels are nuisance species that can be accidentally transported by recreational boaters when caught in propellers, intakes or attached to hulls. Do not underestimate PWCs – they are very powerful for their small size and demand the same respect as any boat. In fact, PWC operation must adhere to the same rules and regulations as any other powerboat – including registration with the state and a B-1 class fire extinguisher on-board. Operation of a Personal Watercraft between the hours of sunset and sunrise is prohibited. The operator as well as all passengers of a PWC must be wearing a PFD. When towing someone on a tube or on water-skis there must be capacity on the PWC to accommodate the operator, the observer as well as the tuber/skier(s). PWC must remain at a distance of 100ft from other water skiers or others being towed behind a vessel. Any manually propelled vessel (ie, canoes and kayaks). Note: This becomes 50 feet if operating in a narrow channel.